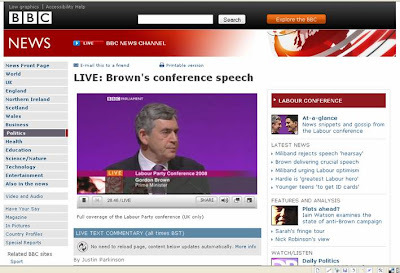 Gordon Brown's Labour party conference speech was during the working day and was live streamed through the BBC website. As a result Gordon Brown's Labour party conference speech generated significant online chatter. Twitter came alive, as well as live micro-blogging and commentary through the main UK news sites. CNN in the US are using Twitter in live broadcasts and promoting it heavily. I think the micro-blogs online are interesting, but I wonder when British news organisations will take the next step and include live online feedback into their TV broadcasts around events like the Gordon Brown conference speech?